This press release was originally published by Building Movement Project. Please click the link below to view the original article. 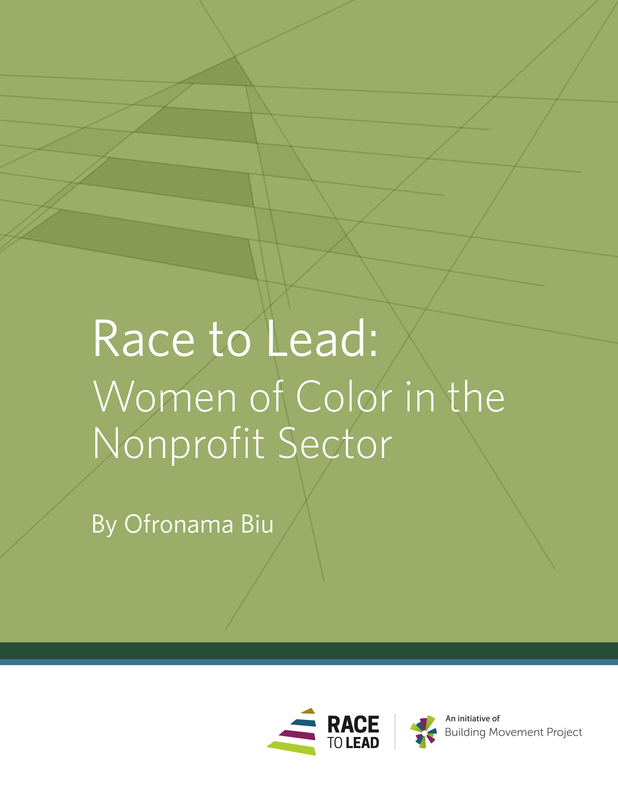 (New York, NY) – The Building Movement Project (BMP) today released a new report, Race to Lead: Women of Color in the Nonprofit Sector, which examines the impact of both race and gender on the career advancement and experiences of women of color working in the nonprofit sector. Based on data from more than 4,000 survey respondents, this latest report in the Race to Lead series shows that women of color encounter systemic obstacles to their advancement over and above the barriers faced by white women and men of color. Education and training do not provide equity. Women of color with the advanced education were more likely than men of color, white men or white women to work in administrative roles and the least likely to hold senior leadership positions. Women of color also are paid less compared to men of color and white men and more frequently report frustrations with inadequate salaries. Leverage the power of philanthropy. Funders should examine their own grant-making practices to support more organizations led by women of color. Funders should also encourage their grantees to embark on a race and gender equity journey by asking about the racial composition of staff and boards of organizations in grant proposals and demonstrating to organizations that the diversity information informs their strategy and funding decisions. Advocate for enforcement of anti-discrimination laws. The nonprofit sector should advocate for the Equal Employment Opportunity Commission to receive more appropriations to investigate charges of discrimination—even if this means uncomfortably turning the lens on itself. Address internal biases. Organizations should address both conscious and so-called “unconscious” biases that affect the mentoring, feedback, evaluations and overall treatment of women of color. These steps toward equity cannot be limited to anti-bias training, which is necessary but insufficient. Nonprofit organizations also need robust and equitable HR policies and systems that will set an expectation that racism, sexism, anti-trans bias, etc. will not be tolerated, and also enforce real consequences for staff who violate those expectations. Create peer support affinity groups for women of color. Peer support does not take place by happenstance: it must be intentionally structured and supported. Peer support should be understood as a supplement to—not a substitute for—in-organization mentoring opportunities provided by supervisors and other senior staff, and increased grant investments in women of color-led organizations.